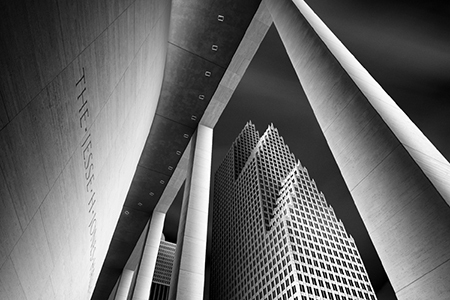 Houston’s distinctive architecture serves as Mabry Campbell’s primary subject in sharply focused, dramatic photographs. After arriving to pursue a graduate degree at Rice University, the artist developed a keen interest in the city’s iconic landmarks. “Enter Performing Arts” is a powerful image of Philip Johnson’s Bank of America Center downtown as seen from Jones Hall. Campbell uses two of the eight-story columns that surround Jones Hall to frame one of Houston’s most significant postmodern high rises, with its gabled roofline punctuated by spires. Timed exposures of up to 10 minutes produce high-contrast, saturated images. Compositionally, the image is built on a series of triangles, quadrilaterals, and rectangles presented in contrast to the cylindrical exterior of the building. Most of his photographs contain a related series of geometric elements. Campbell typically works in black-and-white, but this exhibition includes a series of color images of the James Turrell “Skyspace” at Rice University. It captures the color shifts that take place at sunrise or sunset, when the structure’s LED lights project onto the ceiling and through an aperture in the roof. The prints are titled for their dominant colors — blue, orange, pink, purple, white, green — and glow with an otherworldly presence, a spaceship that has just landed. One of Campbell’s stated goals is “to amplify inherent qualities in forms to create images with suggested emotion and heightened visual presence.” The “Skyspace” series conveys the sublime experience of personally witnessing Turrell’s manipulation of light. Campbell spends hours processing his images, manipulating lights, darks and colors to create certain moods. The aesthetic stamp of Ansel Adams is apparent and acknowledged by the artist. He offers a fresh look at other Houston landmarks, including the Gus Wortham Memorial Fountain and the Philip Johnson-designed Chapel of St. Basil. The exhibition also includes images of Icelandic landscapes, Ranchos de Taos Church in New Mexico and the Chapel of Thanksgiving in Dallas.